The Merseyside Few is hugely indebted to South Lancashire Aviation for their work that is incorporated into these pages on Jindřich Bartoš. Jindřich Bartoš is one of the three Merseyside Few who are obviously not from Liverpool or Wirral. He is buried in West Derby Cemetery, section 11 RC grave 392 with a compatriot, Otto Hanzlíček. West Derby Cemetery, in Lower House Lane, Croxteth [Google map], is a sprawling mass of graves, some well maintained some not. The cemetery was opened in January 1884 and consecrated six months later on 28th June. It has been used for both Church of England and Roman Catholic burials and a number of its buildings have been accorded a Grade II listed status. Just inside the entrance is one of those signs showing a map of the cemetery and its sections. These things are never easy to follow as the sections themselves are not marked at all. It turned out that Bartos’s grave was about as far from the cemetery gates as you can get but I was pleased to see it was well maintained. So who was Jindřich Bartoš and how did he come to be buried on Merseyside? Jindřich Bartoš was born in Lugansk, south-eastern Ukraine (then in the Russian Empire) [Google map], on 16 November 1911. The naming of his home town follows the ebb and flow of military power in the region. In 1938 Lugansk was renamed Voroshilovgrad in honour of the Soviet military commander Kliment Voroshilov but the original name was reinstated in 1958. It was changed back again following Voroshilov’s death in 1970, and finally returned to Lugansk as the Soviet Union collapsed in 1990. It’s not clear when or why Jindřich Bartoš left Ukraine. He attended the Army Academy in Hranice and Prostějov [Google map] in Czechoslovakia – a neighbouring nation that did not exist at the time of his birth – and in 1934/35 graduated as a pilot. He served in that capacity with the 2nd Air Regiment. After Germany invaded Czechoslovakia in 1938 he escaped to Poland in the summer of 1939 and then sailed to France. As France was not yet at war with Germany, Bartoš was given a passport and, with other immigrants, expected to join the French Foreign Legion. Refusal to do so would have led to repatriation to Czechoslovakia. Once war was declared he was transferred to the Armee de l’Air. 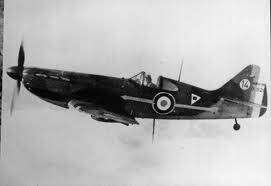 There he became a participant of the Battle of France as a member of fighter squadron Groupe de Chasse I/3. 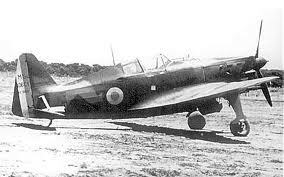 At the outbreak of World War II, Groupe de Chasse I/3 had been equipped with the comparitively weak Morane-Saulnier MS.406. After seeing combat during the Phoney War, the squadron relocated to southern France. While at Cannes-Mandelieu on the Mediterranean coast [Google map], the unit converted to the new Dewoitine D.520 fighter, which was much more of a match for the German Messerschmitt Bf109. When the Battle of France began in May 1940, it was the only unit to be operationally ready with the D.520, which it first took to battle on 12 May after hastily relocating to Wez-Thuisy in north eastern France, east of Paris, near the borders with Germany and Luxembourg. [Google map showing a satellite photograph on which you can see traces of the Battle of France runways]. Groupe de Chasse I/3 was then based at Esbley, nearer Paris, [Google map] between 17 May and 18 June 1940. Flying a Dewoitine D.520 Bartoš engaged in a dogfight over Paris on 3 June 1940 and was shot down. He crash landed having sustained light wounds. He was credited with damaging his oppenent’s aircraft, a Heinkel He111. In late June 1940, as the fall of France became inevitable, Groupe de Chasse I/3 crossed the Mediterranean to Oran in Algeria to escape capture. From thereBartoš sailed, via Casablanca on the Royal Scotsman and Gibraltar, where he transferred to the David Livingstone, for Britain where he landed in Cardiff on 5 August 1940. This is the same day and route that another of the Merseyside Few, Otto Hanzlíček, travelled. He would be posted to the same squadron as Bartoš six weeks later and both were destined to share the same grave.